Key principle of profile-writing: Whenever possible, talk to mom. Mothers possess that perfect combination of knowing the subject quite well and being ace blabbermouths. This profile illustrates that truth quite nicely. Really ⁦@nytimes⁩ you dig up some BS on ⁦@neeratanden⁩ via her mother?!? Because she is assertive & a leader? I just spent 3 hours talking about gender media bias on ⁦@MakeItPlain⁩ & you proved my point for me. ⁦@SXMProgress⁩ SMH. Wow, wouldn't it be great if CAP were headed by a person who a) had values beyond fundraising from the likes of Zuck and Bibi, b) wasn't obsessed with fighting battles she's already lost (eg 2016 election), and b) didn't yell at grad students at 2 a.m.? Trying to picture the male leader of any organization anywhere, where his mom is used in this way. ⁦@nytimes⁩, why weren’t the other moms quoted if they are such a key source? In an article about tensions between @neeratanden & the Sanders camp, Ms. Tanden’s mother shows up in an extensive quote about Tanden’s fighting style. Not w/some great antidote from when Tanden was a kid but as a contemporary validator. Odd. .
New from @NYTLiz & @kenvogel: The battle between a leading Clintonworld think tank and the self-styled Sanders insurgency. Note to my reporter friends: Please never interview my mom about my professional accomplishments. She's a pretty biased source. Articles like this underscore how important the Times’ Public Editor was. The reporters quote ⁦@neeratanden⁩’s mother but not Neera Tanden—and don’t reveal whether she refused to comment. Really unprofessional journalism. Blaming “millennial agitators” for your problems while hanging around with Netanyahu and Bin Salman’s brother. Quite a look for “mainstream” dems. This is bizarre. Interviewing someone’s mother??! Weirdly ignores part about CAP central role in ACA. No doubt, @neeratanden is a scrapper. I’ve been on the receiving end. But the thing that makes this story a little odd is that it relies so heavily on the quotes of her elderly mom. Always uneasy when unsuspecting family members as drawn into the fray! Neera Tanden’s mom is the MVP of Internet feuds. 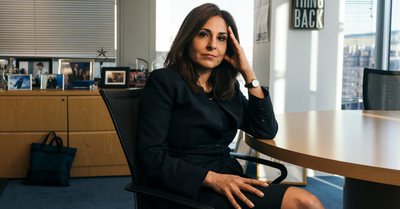 Let me get this straight: @nytimes profiled a powerful woman in politics @neeratanden, head of one of the country's most important political think tanks. And they quote AT LENGTH her MOM? Lord, help us all. The existence of this piece, and calling @neeratanden Mom for quotes on her daughter 🤔is so petty and Who cares? Yep, I’m going to need some more Yikeses.